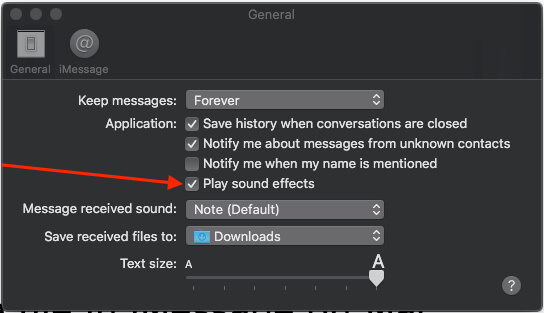 Many Mac users have been complaining that unable to use Messages app or iMessage send or receive on your Mac running MacOS Mojave. I Know macOS Mojave has the biggest update ever, Are you new Mac user or Setup Clean install MacOS Mojave. Then you might be not getting or sending a message from your Mac cause of old settings are reset or overwrite. In this article, we cover all major issues and troubleshooting tips on how to refresh your Mac again to use iMessage. Thankfully, Apple is abandoning the need to download the third-party applications and developing a better world for its customer. If you want to connect with video call, then simply go to FaceTime [Having FaceTime issues], want to pay money then Apple Pay is there for you etc. Likewise, to text someone without spending extra bucks than use iMessage, only you will need an internet connection. All these facilities are available on almost all devices like Mac, MacBook, iPhone, iPad, and iPod. Though it will take some time to build a stable platform. Till then we have to face and fix our issues whether it is FaceTime Not Working or iMessage waiting for activation. The problem with iMessage in Mac after updating to macOS Mojave is, in spite of perfectly logged into iCloud are showing Authentication error, and so iMessage is down in macOS Mojave. My Mac Won’t receive or send Message: is apple server down? Check Apple System status. Messages app on Mac required valid authentication; First Authenticate your Apple ID in Message app to start New Conversation, receive a message or reply text message. Open “Messages app” on Mac using Spotlight Search. After a long time you haven’t used Mac for Message. 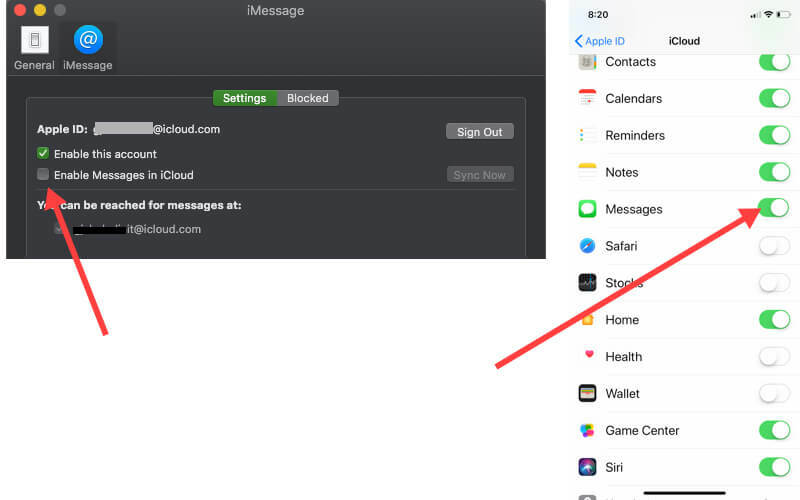 Logout and Login Message app on Mac. 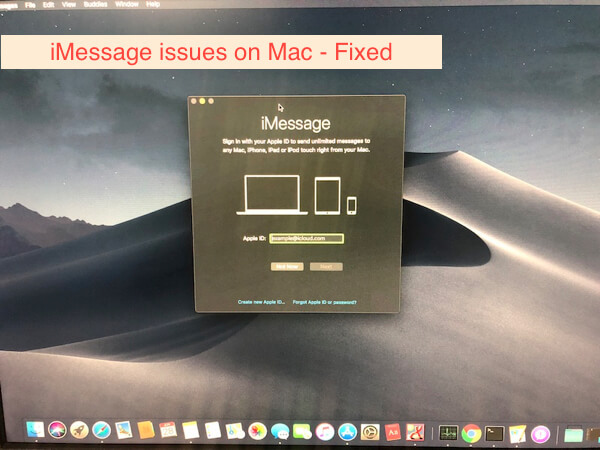 reboot your Mac in Safe more works in most cases, my Reader “titioft” share the problem and fix that work for him, boot in safe mode (maintain shift key while powering-on the mac until the beep and the apple logo). that help you to login back in iMessage & FaceTime. You are unable to start a new conversation because of no any another device found on Mac. First Sync all the iPhone contacts means iCloud contacts to your Mac. Go to “System Preferences“on Mac. 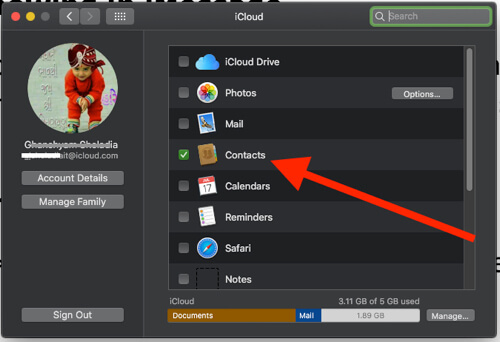 Click on “iCloud” > Login with “Apple ID” if not > Enable or “Keep selected Contacts”. More, you can create Group chat for text with multiple people at once. Add more contacts and enjoy. Now, You can search All the Contacts and Apple ID saved in the contacts app. Not necessary all contacts has iMessage enabled. You can only sent or This Apple ID or number for that iMessage activated. We can set it from the iOS device: First, try activate iMessage on the Phone number. In case you failed, iMessage Waiting For Activation error than try to enable iMessage on Apple ID. 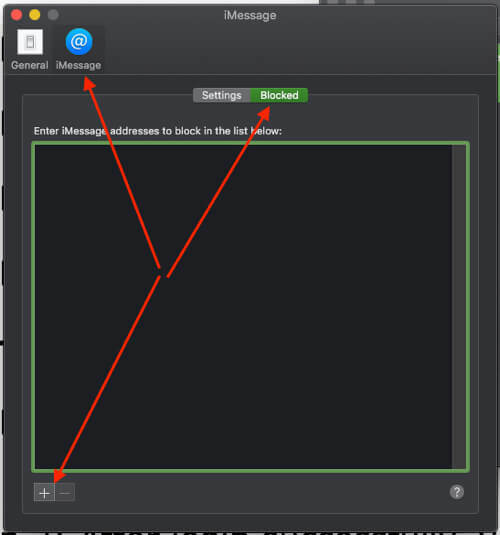 Open “Messages app” on Mac. Also Enable On iOS: Go to the “Setting app” on iPhone > “Profile Name” > “iCloud” > “Turn on Toggle” for Messages. You should check Do not Disturb not turned on for the contact from Message app contact details. Open your Conversation, Tap on “Details” at the top-right corner of the app. 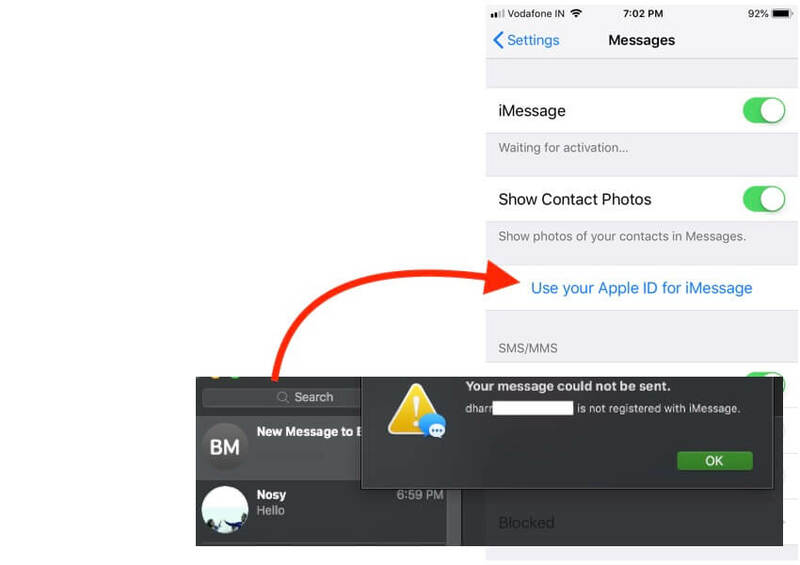 Contacts added in Blocked list unable to receive iMessage or send from your Mac. First, check the settings and unblock them. 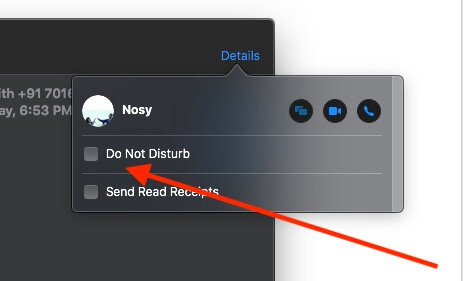 Go to the Messages app preference on your Mac (MacOS Mojave), Open “Messages app” > “Preferences” > “iMessage” Tab > “Blocked” Tab > Select “Contact” and Click on (-) sign to remove from list. Try Again or Force Close app, I think it should be okay now. Step 1: Click on “Apple menu”. Open “System Preferences”. Step 3: Click “Sign Out”. Step 4: Select “Keep a Copy”. Step 5: Download all files locally. Step 6: Click “Keep on This Mac”. This will save credentials locally. Step 2: After login successfully, you now send and receive iMessage on Mac. Step 2: Enter “iCloud” details. Check Your Mac’s system sound is turned on. Next to click on “General” Tab > Select One of three options from the Dropdown list. In case you remove the conversation from the list of Messages app. Another option is here that prevent and stay all the conversation after you delete or remove/ Closed. 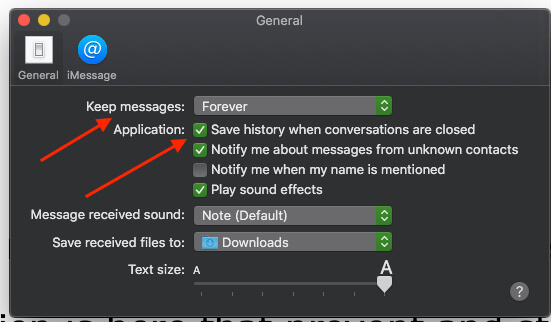 Enable – “Save history when conversations are closed”. Force Close app and Reopen Messages app on mac. Go to Message preferences page, “Messages” > “Preferences” > “General” > Use Dropdown option and Click on “Other”. Choose Finder location and “save” it. Click and Hold on Message to see quick Tapback options in the popup. Or Right click on Message to see Tapback option. Above are the most common Q&A for iMessage problems that help to fix and answer your questions. More Burning Questions and troubleshooting, please share with us via comments. I tried this with no success. I finally called Apple Support and they asked me to boot in safe mode (maintain shift key while powering-on the mac until the beep and the apple logo). This actually did the trick and helped me logging in back again under iMessage and Facetime with my appleid. I was not able to do that before right after the upgrade. All the above works for me, but pics and videos… they show they are fine on the Macbook pro, but they she “downloading” on the phones, both mine and the people I am sending it to. On each iOS device, go to Settings > Messages > Send & Receive > Apple ID > Sign Out. FaceTime is joined at the hip with Messages, so then go to Settings > FaceTime > Apple ID > Sign Out. Then on all Macs signed in to the same Apple ID, go to Messages > Preferences > iMessage > Sign Out. Then, on all Macs, launch FaceTime > Preferences > Log out. Then, re-boot all devices and repeat all in reverse order. FIXED!! Thanks for share with us! and Valuable time. This approach (Phil Gonsoulin’s) seems to have worked for me. It seems odd, but now that I’ve signed out and restarted all my devices and signed in again, Messages seems to working properly again. Thanks for sharing your experience! Thanks Phil Gonsoulin, that fix did the trick!